A tourist attraction which continues to grow in popularity is orca whale watching, from the south to the north of Vancouver Island. One of the best places in Canada to see orca whales is from Northern Vancouver Island - and this is where it all began, from a tiny boardwalk community called Telegraph Cove. Although this is where killer whale watching started, the number of commercial whale watching operations in the area is still very small compared to the southern operations and therefore make for a unique whale watching experience. One of the most popular ways to view these beautiful marine mammals is by joining a kayak tour for single or multi day tours. While a day tour suits those with limited time on their hands, the multi day kayak trips are operated from base camps and range in length from approximately 5-8 days. 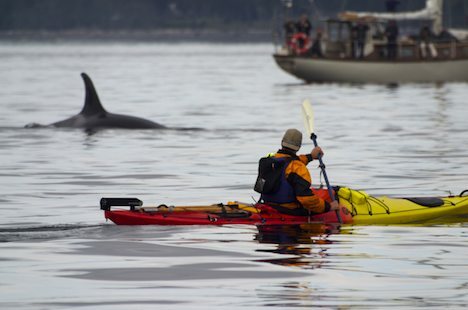 Kayaking with orcas is a great, low impact way to view wildlife in their natural environment without disturbing them. There are several operators of kayak tours who depart from Port McNeill or kayak rentals from Telegraph Cove. Killer Whale and kayak, Orca Whales photographed on whale watching tours off Northern Vancouver island in British Columbia, Canada. cruise by in the waters off Vancouver Island.